Russia has been fanning the fires of separatism in Ukraine, but the government is not so keen on separatism at home. The National Bolshevik platform is a small group of Eduard Limonov's former supporters, mainly Muscovites and Siberians. If the 'March for Federalisation' announced by the platform had been permitted, it is highly likely that central Russian media would not have been at all interested in it. The Siberians were actually only asking to keep more taxes, and send less to Moscow. The Mayor of Novosibirsk nevertheless banned the march, which gave rise to brief reports in the Moscow media. But it was the actions of media watchdog Roskomnadzor and the Prosecutor General, which really pushed the theme of separatism into the limelight. In the case of the federalisation of Siberia, Roskomnadzor made an unprecedented attempt to destroy the discussion of a topic on the Russian internet or Runet. From the beginning of the month until 17 August, when the march was scheduled, tens of blog posts, social media groups and publications in the media were blocked. The original instructions came from the Prosecutor General, framed as a defence of Russia's sovereignty and part of the battle with extremism; and denouncing calls to join unsanctioned demonstrations and rioting. When comments started appearing in the pro-Kremlin media at the beginning of August suggesting that Roskomnadzor activities were, in fact, harmful, and would only enhance any interest in separatism, this made no difference to Roskomnadzor. My article on separatism on the New Times site appeared at 21.35 on 15 August i.e. two days before the march. At 14.07 on 16 August, the editor was instructed to take the article down. Roskomnadzor people were 'looking for separatism' out of work hours, but by that time my article had been reposted elsewhere. So, although New Times took it down (and demanded an explanation from the watchdog), the banned text is still on the internet and has been read by many more people than might have been expected. The more the 'separatists' are banned by prosecutors and RuNet overseers, the more people talk about them. The more the 'separatists' are banned by prosecutors and RuNet overseers, the more people talk about them. The row over 'federalisation' and 'protecting the regions from Moscow avarice' made this topic another focal point for the remains of the 'white ribbon' movement. 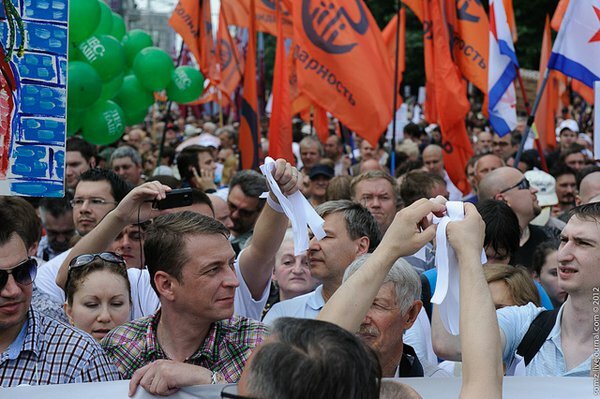 On 17 August, there were small demonstrations in support of 'federalisation' in Novosibirsk, Krasnodar and Yekaterinburg; and all encountered varying forms of police hindrance, though to date it would appear that there have been no criminal charges. The 'white ribbon' supporters have one important reason for taking part in this discussion: it is not their in-depth knowledge of, or interest in regional economics, but rather a means of protesting against Kremlin hypocrisy. It is all right to call for 'federalisation' in Ukraine, but not in Russia, a country that is becoming ever more centralised. Other Russian 'people's republics' have started putting forward their ideas and propaganda on the internet. The Kaliningrad, Kuban, Smolensk and Siberia People's Republics have their own flags and social media groups. The Siberian 'Republic' also had a video showing armed, masked men promising an attack on the police and FSB (security service) officers who tried to prevent demonstrations in support of 'federalisation.' It has not been possible to establish in which city the video was filmed. These 'republics' are parodies of the symbols and rhetoric of the Donetsk and Luhansk People's Republics. Rustam Vasilyev is leader of the 'Baltic republicans,' groups of activists who have been lobbying for greater independence for the Kaliningrad region since the 90s. He told me that the Kaliningrad People's Republic is a purely Ukrainian-inspired project. Local supporters of breaking away from Russia call their city Königsberg, the German name it used to have, rather than Kaliningrad. The Kuban People's Republic, on the other hand, has people who campaign openly in Ukraine and in Russia. Since the 20th century, Ukrainian nationalists have regarded Kuban as Ukrainian territory, which allows the 'republic' to hope that it might receive material assistance from Ukraine. Since the spring of this year, Russia has had a law, carrying a punishment of up to five years for 'promoting separatism'. Regional political parties have been banned in Russia for a long time, so as to avoid any lobbying by any small-town local interest groups. Since the spring of this year, Russia has had a law, which carries a punishment of up to five years for 'promoting separatism.' The Ukrainians are sure that it was passed because of the annexation of Crimea, but this is not the case. The idea for the law appeared at the end of 2013, when Maidan was only just beginning. Its proposer was the nefarious deputy Yevgeny Fyodorov, who was calling for sentences of 20 years for this heinous crime. His comrade-in-arms, Mikhail Yemelyanov, commented to me at the time the law was proposed that, while its originators had not yet seen any actual cases of this risk, they assumed that they very well might in the future. However, the State had ways of dealing with separatism even before this became an article of the Criminal Code. Human rights monitoring reports show that people who expressed opinions about some region or other breaking away were charged with incitement to hatred, or calling for unlawful changes to be made to the constitutional system. Russian human rights campaigners are currently focused on the so-called 'Oleg Sentsov case' and the 'Kaliningrad flag affair.' In the first case, a group of Crimeans, who attempted to resist the annexation of the peninsula, have been accused of terrorist offences, with two small cases of arson laid at their door. In Kaliningrad, the German flag was raised over the local FSB building, and three people are in pre-trial detention on charges of disorderly conduct. One of them is also charged with being in possession of the explosive, hexogen; and one of their friends is accused of possessing ammunition. August polling data from Aleksei Navalny's Anti-corruption Foundation show that more than 40% of Russians would support more regional independence from Moscow; only 15% think that federal officials have any understanding of what their cities need; and 70% are in favour of direct elections for heads of regions. In recent years, the federal centre has increasingly transferred state responsibility for social care to regional budgets. Many regions are deep in debt, and economists predict that some of them will soon have to declare themselves bankrupt. Local authorities blame Moscow for this, though as yet fear of losing their jobs has prevented them from saying so publicly. In such a situation, separatism might seem appealing. Google 'Russian separatism' and you could spend hours and hours in front of your screen. You might discover that Chechen nationalists think the English are descended from the Vainakh peoples (in North Caucasus); that at the beginning of the 90s, Yekaterinburg printed its own currency, the 'Ural frank,' and received Moscow's permission to introduce it in parallel with the rouble, but were afraid to do so. Until the beginning of the 21st century, Tatarstan was a confederative (rather than federative) part of Russia. You will also discover that there are people who cannot forgive Moscow for suppressing the mediaeval republic of Novgorod in 1570. There are people who cannot forgive Moscow for suppressing the mediaeval republic of Novgorod (1570). Russia has separatist ideas based on ethnicity, religion and regional economic interests. They are, it is true, still only marginal and have not become mass movements or been openly supported by groups of the elites. But the current renaissance of Novorossiya (New Russia – a term in use 1764-1873 for parts of Russia and Ukraine), shows that this could all become quite serious. The Donetsk People's Republic was formed in 2005 during the Orange Revolution, taking its inspiration from the short-lived Donetsk People’s Republic that existed shortly after the Russian Revolution of 1917). It was soon banned in Ukraine, and so for many years it was a numerically insignificant, marginal, and informal community. Today, the flag of the DNR is the black-blue-red tricolour of 2005; and the founder of the Donetsk Republic, the businessman Andrei Purgin, is first deputy prime minister in the DNR government. Anything is possible. The Russian civil service has retained the continuity and style of late-Soviet managers, and its way of thinking is extremely un-ideological. Civil servants will defend any principles, which will keep them in their jobs: Communism, orthodoxy, democracy, and nationalism, whatever – they are prepared to work under any banner. This is how the Communist bosses have managed to remain in power in their former Soviet republics; and the elites of many Russian regions gave a good deal of hard thought at the beginning of the 1990s as to whether they would stay in the Russian Federation or not. But even the most fervent supporters of sanctions against Putin and his government should, if they are at all intelligent, not wish to see Russia collapse into separate regions. In its place there would be an unknown number of 'Novorossiyas' with governments of completely unpredictable degrees of lunacy. Nuclear weapons were taken out of Ukraine at the beginning of the 90s; Russian weapons would end up in the hands of Cossack hetmen, leaders of criminal cartels, of totalitarian sects, Wahhabi muftis, admirers of Joseph Stalin, pagan priests, and other more or less 'exotic' people. Better the devil you know, than the devil you don’t.